This is the cover to the HERO Book One. It features HERO and Pudge and a host of Bad Guys in the background. When Book One is printed, the cover will be fully colored by Avery Butterworth. This is the first page of Book One and features HERO's home in the Tillmar Valley. This is the first Double Page Spread for Book One. This was a large hurdle for me and once it was done, everything else just started to flow smoothly. This was originally the cover for the preview mini comic of HERO Chapter One done as a giveaways at conventions. It was later used as page 13 of Chapter One and HERO's name page. 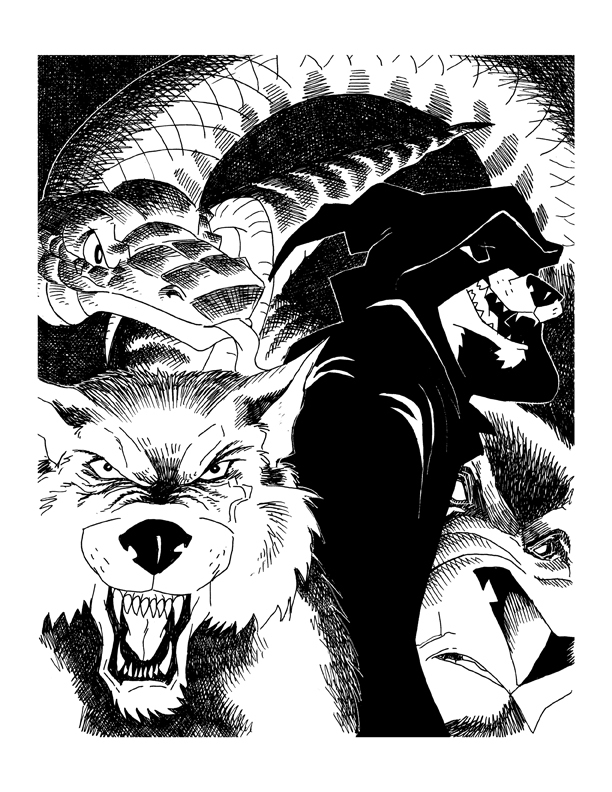 This illustration was originally a pinup for Chapter Two of Book One but was later used as the front inside image for the same book. This was originally planed as a Pinup for Chapter Three but was alter used for Page 71 of Book One and the layout sketch was used for the cover to the preview mini comic of Chapter Three. This was the Pinup done for Chapter Five of Book One and features the character Uncle Quincy, the Great Big Brown Owl. This pin up was done for Chapter Six. It was also my attempt to re-do the very First HERO Illustration. This was a Pinup done for Chapter Eight of Book Two and features an Eight Legged Creeper. This was the Pinup done for Chapter Eleven of Book Two and features the return of HERO's older brother Brock and Granny Ora. It also shows a trio of evil Ferrets that will torment HERO in Book Two. The background for the cover image was done as a separate illustration. This Pinup was done for my sister as a Christmas present. She is a big fan of Peter Pan and I did this one with elements from that story. This Illustration was done as a Christmas present for my mother who is a fan of the Jacksonville Jaguars (obviously). This Pinup was done for my Aunt as a Christmas present. She loves doors and door frames and this one just worked. This Pinup was done as a Christmas present for my Grandmother-in-law. The idea was that the Momma Ladybug represented her and the 7 babies were her Great Grandchildren. Since then I found out she now has 8 Great Grandchildren (oops). This was a Christmas present for my mother-in-law. Years ago, she created a character called Percy who was a garden snake and has wanted me to do an illustration of him for years. This is how I incorporated him and HERO. This was a Pinup done for my Aunt who has a dog named USA and a bird named Rio. I drew them as characters in the HERO Universe. USA is a barbarian riding on the back of a huge crab and Rio is flying in front of them.